Twin Falls pours out of the walls of a gorge, instead of over the walls. 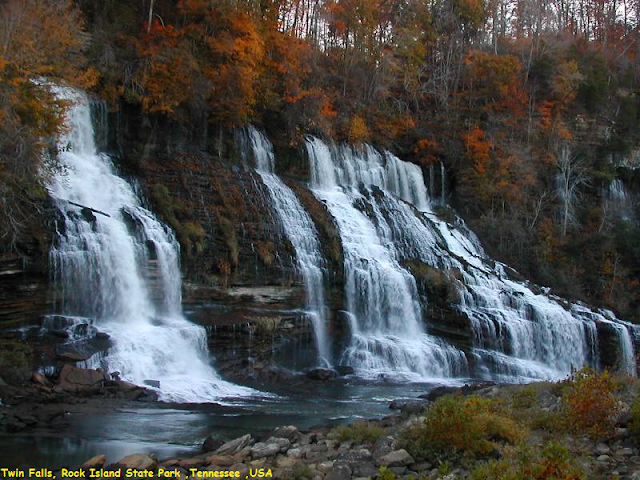 This interesting and easy to visit waterfall was accidentally created when the Caney Fork River was dammed. Twin Falls is not a natural waterfall. It is a byproduct of the damming of the Caney Fork River and the power house. The dam backed up the Caney Fork and Collins River. The Collins flows into the Caney Fork about a mile upstream of Twin Falls, but at this point the two rivers are only 1000 feet apart.